James Baldwin (August 2, 1924 – December 1, 1987) was a novelist, short story writer, and essayist, who is regarded as one of the most important African-American writers of the mid twentieth century. As a young man, Baldwin was primarily influenced by Richard Wright and other novelists of the black radical tradition, and Baldwin himself would come into his prime as a writer during the 1950s and 1960s as one of the most outspoken and poignant authors in a period of immense cultural change. Today, Baldwin is regarded as one of the most eloquent and one of the most progressive of all African-American novelists; his works were among some of the first in African-American literature to move outside the black experience, to address issues of identity pertinent to people of all races and backgrounds. Baldwin is also considered by many critics to be one of the most inherently talented American writers of the mid twentieth century, who was capable of producing masterpieces in a variety of genres, including novels such as Go Tell It On The Mountain, essays such as The Fire Next Time, and haunting short stories like "Sonny's Blues." In the years since his death, Baldwin has become an influence not only to African-American writers, but to American literature at large. Baldwin was born in New York's Harlem neighborhood in 1924, the first of his mother's nine children. He never met his biological father and may never have even known the man's identity. Instead, he considered his stepfather, David Baldwin, his only father figure. David, a factory worker and store-front preacher, was allegedly very cruel at home, and the young Baldwin never forgave him for it. While Baldwin's father opposed his literary aspirations, he was able to find support for his writing from teachers, as well from the mayor of New York City, Fiorello H. LaGuardia, who took the young Baldwin under his wing. Baldwin's most important source of support, however, came from his idol Richard Wright, whom he called "the greatest black writer in the world for me". Wright and Baldwin became friends for a short time and Wright helped him to secure a scholarship which assured him his financial independence. Baldwin titled a collection of essays, Notes of a Native Son, in homage to Wright. 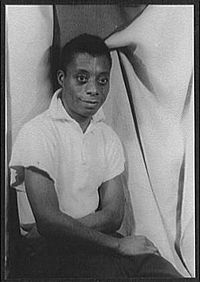 The close friendship between the two writers, however, would come to an end with the publication of Baldwin's 1949 essay "Everybody's Protest Novel," in which Baldwin asserted that Native Son, like Harriet Beecher Stowe's Uncle Tom's Cabin, lacked credible characters and psychological complexity. Wright never forgave Baldwin for the criticism, and the two stayed on icy terms until the elder writer's death. Many years later, during an interview with Julius Lester, Baldwin explained that his adoration for Wright remained: "I knew Richard and I loved him. I was not attacking him; I was trying to clarify something for myself." Baldwin, like many American authors of the time, left to live in Europe for an extended period of time beginning in 1948. His first destination was Paris, where Ernest Hemingway, Gertrude Stein, F. Scott Fitzgerald, Richard Wright, and many others had lived during their writing careers. While living in Paris, Baldwin wrote his first two novels, Go Tell It On The Mountain (1953) and Giovanni's Room (1956). Go Tell It On The Mountain, Baldwin's largely autobiographical tale of a dysfunctional black family's experiences on a single day at church, would catapult the writer to instantaneous fame. Giovanni's Room, however, would shock and confuse many of Baldwin's readers with its frank depictions of sexuality as well as for its complete absence of black characters. When Baldwin returned to America, he became actively involved in the Civil Rights Movement. He participated in the march on Washington, DC, with Martin Luther King, Jr..
After returning to the United States, Baldwin would continue to write, but with the exception of The Fire Next Time, a book of essays on the Civil Rights Movement published in 1963, most of his works would be of diminishing quality. During this time Baldwin attempted to write another, extremely ambitious novel. Another Country treats issues of racial, gender, and sexual identity through a large cast of multicultural characters, but the book proved to be a critical failure. After attempting to make a new career for himself as a playwright, Baldwin would largely resign himself from literary writing, splitting his time between lecturing in the United States and writing essays in Southern France. He would sporadically continue to make attempts at fiction over the last two decades of his life, but none of Baldwin's works from his later period have garnered any critical acclaim. Baldwin died of cancer in 1987, at the age of 63. Go Tell It on the Mountain is generally considered to be Baldwin's masterpiece, and one of the most important works of twentieth century African-American literature. The novel examines the role of the Christian Church in the lives of African-Americans, both as a source of repression and moral hypocrisy, and as a source of inspiration and community. It also examines themes of racism and chauvinism in the United States. The opening chapter tells the story of John, a young African-American boy in Harlem in the early part of the twentieth century. John is the son of Elizabeth and her preacher husband Gabriel, a strict disciplinarian. Gabriel's religious philosophy is strict and is one of salvation through faith in Jesus, without which one is damned to hell. John hates his father and dreams of running away and escaping the oppressive life of a preacher's son. The novel is made up of five parts: A chapter told largely from John's perspective; then three chapters called "The Prayers of the Saints," told from the perspectives of John's aunt Florence, his father, and his mother; and a concluding chapter told in the third-person. Florence's prayer tells her life-story. She was born to a freed slave who chose to continue to work in the South for a white family. Her mother always favored Florence's younger brother Gabriel, causing Florence to feel a yearning need to escape from her life. Florence buys a one-way train ticket to New York and leaves her mother on her deathbed. In New York, Florence marries a dissolute man named Frank, resulting in a power struggle within their marriage, which ends after ten years when Frank leaves one night and never returns. He later dies in France in World War I, but Florence only finds out from Frank's girlfriend. Gabriel's prayer starts with a description of his ways as a teenager, before his rebirth in Christ and the start of his career as a preacher. His conversion comes as he forms a relationship with a slightly older woman from his town named Deborah, who was gang-raped as a teenager by a band of white men. Deborah is devout in her faith, and Gabriel uses her strength to become a successful reverend himself. However, despite his religious convictions, Gabriel is unable to resist his physical attraction for a woman named Esther. He has a brief affair with her but then ends it due to his sense of guilt. When Esther finds herself pregnant, Gabriel gives Esther the money that Deborah has been saving so that Esther can go away to have her baby; she goes to Chicago but dies giving birth to their son, Royal. Royal knows his father but doesn't know of their relationship, and is eventually killed in a barroom fight in Chicago. Gabriel is powerless and unable to stop his son's murder. Elizabeth's prayer, the shortest of the three, tells her story. As a young girl, Elizabeth was very close to her father, but when her mother dies, she is shipped off to live with an imperious and cold aunt, and then goes to live in New York with a friend of the aunt's who works as a medium. It turns out that Gabriel is not John's biological father. Elizabeth left home with her boyfriend, Richard, a "sinner" who had no time for God and who promised to marry Elizabeth but never did. Richard is arrested for a robbery he didn't commit, and while he is acquitted at trial, the experience—including the abuse he takes at the hands of white police officers—leads him to commit suicide on his first night home. Elizabeth, then just a few months pregnant with John, takes a job, where she meets Florence. Florence introduces her to Gabriel, whom she marries. The final chapter returns to the church, where John falls to the floor in a spiritual fit. He has a series of dreamlike visions, seeing visions of hell and heaven, life and death, and seeing Gabriel standing over him. When he awakes, he says that he is saved and that he has accepted Jesus. Yet even as the group leaves the church, old sins are revisited as Florence threatens to tell Elizabeth of Gabriel's sordid past. ↑ Julius Lester, James Baldwin — Reflections of a Maverick The New York Times, May 27, 1984. Retrieved December 10, 2012. All links retrieved March 15, 2018. "An Open Letter to My Sister, Angela Y. Davis" by James Baldwin. Baldwin's C-Span page on American Writers. Baldwin in the Literary Encyclopedia. This page was last modified on 15 March 2018, at 15:21.